If you know of the name, it’s perhaps because of the wonderful indie and rock baby shoes by the same maker. 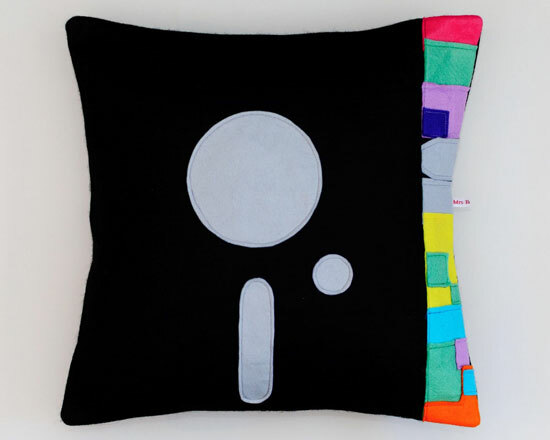 Now Mrs Bojingles is doing home designs too, including this wonderful New Order Blue Monday cushion cover. In fact, if you like classic rock and old school indie, do check out the full range, as there are some amazing designs in it. But this one jumped out at us. A cushion version of the classic Peter Saville sleeve for equally classic 1982 12-inch single. As you probably know, the original cost so much to produce that Factory Records lost money on each copy sold! Hopefully that’s not the case for the maker here, who has recreated the sleeve in felt and cotton. The finished item is 41cm x 41cm, which is ideal for a standard cushion inner. If you want one, each is handmade and selling for £41.98.